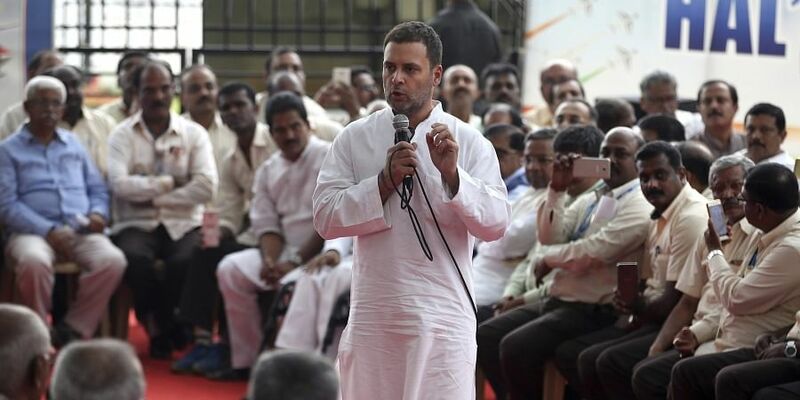 BENGALURU: Congress president Rahul Gandhi today described HAL as a "strategic asset" in aerospace, saying the country owed a debt to it, as he stepped up his campaign against the Modi government over the Rafale fighter jet deal. Reaching out to present and former employees of the defence PSU at an interaction with them here, Gandhi said, work done by HAL for the country was tremendous and the country owed debt to it for "protecting us" and creating a scientific vision. "HAL is a strategic asset in aerospace, not an ordinary or regular company," Gandhi said at the event organised at Minsk Square near the HAL headquarters. He said he was interacting with the employees to understand how to make "this strategic asset" (HAL) more effective "so that when we come to power, we will do it more aggressively." Gandhi's interaction is part of his onslaught against the Modi government over the Rafale deal in which he alleges HAL had been overlooked in the offsets contracts with French aerospace company Dassault Aviation preferring Anil Ambani's company.